Track 1: We'll Gather Lilacs - 2'45"
Track 2: Rhapsody on a Windy Night - 6'16"
Track 3: The Rock - 8'31"
Track 4: The Dream - 6'10"
Track 5: The Love Song - 3'59"
Track 6: Dialogue with Roy Hart - 2'54"
Track 7: Kerry Dancers - 1'45"
Track 8: Autumn Leaves - 4'35"
Track 9: Blue Moon - 4'31"
Track 10: Biological Shake - 2'40"
Track 11: David of the White Rock - 3'20"
Track 12: I Love my Body - 3'30"
Track 13: The Straddled Broomstick Rides - 6'07"
Track 14: Somewhere over the Rainbow - 2'48"
This e-book and CD were created to mark 25 years since the deaths of Roy and Dorothy Hart. Compiled and written by Paul Silber and edited by Clara Silber Harris, this second edition 51 page e-book and its accompanying CD is a personal account of some aspects of the lives and researches of Roy and Dorothy Hart. It includes letters, texts, paintings and poetry, as well as, previously unheard recordings of their voices. The first book edition was limited to 100 copies only. 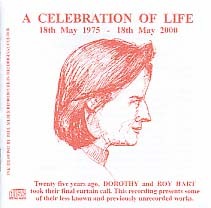 This CD, "A Celebration of Life", is designed to accompany a booklet of the same title. The accompanying notes and my introductions to the tracks on the CD itself serve as a guide to the listener. But for more information on who were Roy and Dorothy Hart, the listener should consult the book "A Celebration of Life". Many of the recordings used on this CD were on cassettes that were Roy's and Dorothy's personal property and were put into my care following their deaths. The emotional cost of making this CD explains why it has taken so long to undertake such a work. Chateau de Malerargues is rather damp in winter and it is certainly not a good place for storing elderly cassettes! Also they were working tapes and had been recorded over and over again. So creating the continuous pieces that can now be heard on the CD has not been an easy task and I am aware that there are technical shortcomings. 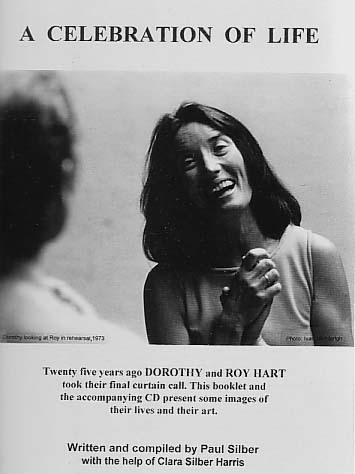 I have not tried to make it a "professional only" disc but, as with the book, I have wanted to convey something of the people and the life force that were Roy and Dorothy Hart. "The human-being holds a thousand contradictions within his nature. In order not to be caught out unawares, these must be explored, made known to him, and then roped to a creative process and purpose. The most obvious split in Western man is between his head and body. We grow biologically to adulthood along paths mapped out for us by centuries of evolutionary striving, the mind scarcely aware of the significance of this. It is an unconscious process carried out faithfully by our bodies. In our work, we aim to get our minds to be conscious of every part of our bodies, and our bodies to express more awaredly what we carry in our minds." "On Friday night, before you perform let there be SILENCE, an attitude of contemplation ....... I will try to put myself in touch with you from 6:30 p.m. PRECISELY ONWARDS until you FEEL that there is ATTENTION. - DO NOT SPEAK ....... contemplate, do NOT try to play dazzling games, have the courage to let your inner voice direct you. All other directors and actors and so-called artists have forgotten that there is a TRADITION of the COSMOS which they deny in favour of being clever or brilliant in other words everything which denies that life is INNOCENT, HEALING, REPARATIVE, it is at once the saddest and happiest of all things."